Kathleen has over 40 years’ experience in health care. She began her career as a Registered Nurse working in the acute care setting in the 1970’s as a staff nurse in CCU and then became a manager in the same area; she has worked as an off-shift supervisor; she has worked in Staff Development, and as a manager of a medical-surgical nursing unit. She has been teaching at Aultman College for the last 11 years. Her teaching area of expertise is in fundamentals of nursing and nursing success. She is a member of NLN and Sigma Theta Tau National Honor Society. Kathleen is committed to Aultman College because it is a student-centered culture framed by the values of quality, integrity, caring, and knowledge. 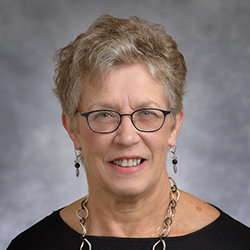 As a member of the faculty, Kathleen participates in college activities that promote nursing excellence, enhance the profession, and benefit the community. Outside academics, Kathleen enjoys reading, gardening, and spending time with her granddaughter.